External hard drives are great for quickly and easily boosting your computer's storage space, and thanks to their easy portability they are ideal for backing up important files and folders. Their biggest problem was speed, but thankfully the popularity of the fast USB 3.0 interface has helped narrow the gap between internal and external drives. The Buffalo DriveStation Velocity is a sturdy and attractively designed device with a USB 3.0 interface. There's no 'on' button, just an LED to tell you the drive's status, a USB 3.0 port, power supply and a small gap for a Kensington lock to be installed for extra security. There is also a small fan to keep the drive cool which produces a little noise, but won't be too noticeable. Our test drive came with a huge 2 terabytes of storage space, though models in 1TB and 3TB sizes are also available. Speeds were excellent, with an average write speed of 156MB/s. A folder containing 455 files, with a total size of 2.08GB, took just 49 seconds to copy over. This is a fast, no-nonsense, external hard drive boasting an excellent build quality. 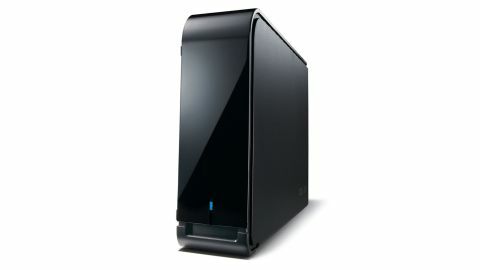 If you're looking for a new external drive then we heartily recommend the Buffalo DriveStation Velocity.